Reliance Jio GigaTV and Jio GigaFiber Will offer Smart Home, 4k channels in India and cheap 4K TV Service. Jio GigaTV and Jio GigaFiber launched, everything you need to know! Reliance Jio has finally announced its long-awaited FTTH services, the Jio GigaFiber. GigaFiber is Reliance Jio's FTTH Home broadband solution that will offer Internet speeds of up to 1 Gbps. Jio GigaFiber and HjJio GigaTV will be available in 1,100 cities throughout India starting August 15. Reliance Jio brings the 4K 'GigaTV' set top box (decoder) with voice control and more than 600 television channels. Reliance Jio promises a 4K experience for its decoder users. Reliance Jio, at his Reliance AGM 2018 press conference, has unveiled a new set top box for viewers in India. The new Jio decoder will be called GigaTV decoder and will offer a 4K resolution on TV channels. Jio's new decoder will also support voice commands in most of India's languages, says the company, with the aim of fulfilling the slogan "Bhasha anek, Bharat ek". In addition, the decoder will also allow multi-party video conferencing, that is, it will enable point-to-point video calls through broadband through the Jio user's television. With the Jio GigaTV decoder, Reliance Jio promises more than 600 TV channels, thousands of movies and millions of songs to be available when the customer requires it. New users who will subscribe to Jio GigaFiber will also have access to a router and Jio GigaTV. The Jio GigaFiber decoder can be used to make voice and HD video calls to other Giga TV devices or users of mobile devices throughout the country. With Jio GigaFiber, Reliance Jio will soon become the largest fixed-line broadband in the world. It is Reliance Jio's fiber-based broadband solution that will offer fixed-line Internet services with speeds of up to 1 Gbps. Jio GigaFiber is a fiber-optic broadband solution that offers superior speeds through wired internet connections. Mukesh Ambani mentioned that most broadband users use fixed line connectivity for more than 80 per cent of their data consumption. But India has one of the lowest internet broadband speeds in the world. Currently, India ranks 134th worldwide in terms of fixed-line broadband connectivity. What is the Reliance Jio plan? Reliance Jio plans to fill the gap, and to boost the broadband sector, the company has launched its own first-class fixed line connectivity. Reliance Jio aims to take Jio GigaFiber and India to the top five on the list. Reliance Jio has already invested more than Rs 250,000 crore to build the digital infrastructure required by Jio GigaFiber. How will Jio GigaFiber help? Jio GigaFiber will enable assistance to provide Ultra HD entertainment with uninterrupted 4K streaming, multi-party video conferencing and smart home solutions with virtual assistants such as Amazon Alexa and Google Home. When and where will Jio GigaFiber be available? Jio GigaFiber's latest cable broadband connectivity will be available in 1100 cities across the country. GigaFiber services will be available from August 15. How to obtain Jio GigaFiber? If you are interested, you can register for Jio GigaFiber through the MyJio application or Jio.com directly. Initially, Reliance Jio will prioritize its launch of Jio GigaFiber to the locations from which the company will receive the largest number of records. The Jio GigaTV, which has been announced in the form of a call feature, will be the basis of Jio's upcoming DTH services. 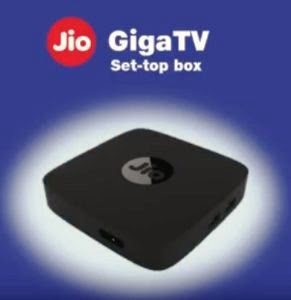 The new subscribers of Jio GigaFiber will obtain a Set Top Box (STB) exclusive to Jio GigaTV with the GigaFiber connection. You can use the Jio GigaTV to make HD voice calls and HD video. It can be used to make TV to TV and TV calls to smartphones or tablets using voice commands. As part of the Jio Smart Home solutions, Jio GigaTV will help households to become familiar with these devices. Jio Smart Home solutions will include smart speakers, smart TVs, smart routers and many more. The TV with the JioGiga TV decoder must be connected to Jio GigaFiber so you can use this function. The Jio GigaTV call can be used to make calls to call any other TV connected to Jio GigaFiber or smartphone or tablet connected to any other network. How to get Jio GigaTV? You can not get a Jio GigaTV without the Jio GigaFiber connection. The registrations for Jio GigaFiber will begin as of August 15, and with your Jio GigaFiber connection, you can wait for the Jio GigaTV STB with it.